A jury has found an Olean man not guilty of attacking his girlfriend's 3-year-old son last January. 30-year-old Robert Battoglia had been accused of attacking the boy in an apartment where he and his girlfriend lived. The boy suffered a pancreas injury that required emergency surgery in Buffalo. Jurors told attorneys after the trial that they didn't believe the boy's injury was intentional, and that they couldn't determine if it was caused by Battoglia or the child's mother. Ashley Howe of Greensburg, center, talks about being the top female high school bowler in the state. Also pictured are Steve Feldman of Byllye Lane, Ashley's step-father Tony Yorio and Frank Williams. After stopping by the studio for The Byllye Lanes Bowling Show, Ashley headed out to Byllye Lanes, where she'll be until around 2 o'clock this afternoon. For everything you always wanted to know about Byllye Lanes, go to Byllye Lanes.net. A 12-year-old boy from Pottstown died while sled riding at Ski Denton in Ulysses Township..
State police say the boy, whose name they didn't release, was on a Boy Scout trip and was sled riding on the slopes at around 11 o'clock last night. The boy was riding on a saucer style sled when he hit a ski lift tower, causing severe trauma to the back of his head. The boy was taken to Charles Cole Memorial Hospital in Coudersport, where Potter County Coroner Kevin Dusenbury pronounced him dead at 1:07 this morning. The boy was later identifed as Ian Miller. Jamestown Community College and D’Youville College have signed an articulation agreement that facilitates transfer into D’Youville’s exercise and sports studies degree program. The agreement guarantees acceptance and junior standing with the transfer of 56 or more credit hours for JCC students who graduate with an appropriate associate’s degree and a minimum JCC cumulative grade point average of 2.5. JCC students are also guaranteed the opportunity to complete a bachelor’s degree in four semesters at D’Youville if they take courses specified in the appropriate agreement as part of their associate’s degree. Upon completion of the bachelor’s degree in exercise and sports studies, students who wish to pursue a doctoral degree are guaranteed acceptance into D’Youville’s doctor of physical therapy program. Students who plan to major in exercise and sports studies have the option of choosing dual admission to JCC and D’Youville. Harrisburg - Pennsylvania high school students are invited to help remind motorists to drive safely by participating in a radio contest sponsored by PennDOT. High school sophomores, juniors and seniors wishing to participate are asked to create a 30-second radio public service announcement, or PSA, focused on safety topics such as aggressive driving, buckling up or driving under the influence. The PSA must include the phrase “Drive Safe PA,” which PennDOT introduced last year as part of its continued commitment to highway safety. HARRISBURG - The Pennsylvania Department of Transportation (PennDOT) is now accepting applications for 2010 summer employment for students and a limited number of non-students, says Rep. Matt Gabler (R-Clearfield/Elk). To qualify, student candidates must be 18 years of age and enrolled in college for the fall semester of 2010. Non-student candidates are not subject to this requirement. The positions are full-time and last the duration of the summer, some commencing as early as April 1. Seasonal employees typically enhance regular maintenance crews on maintenance projects throughout Pennsylvania. Applications can be found at www.employment.pa.gov under the "student summer employment" category. The deadline to apply is the close of business on Friday, Jan. 22. After the seventh round of play at School Street Elementary, four out of the eight teams are now tied for top honors in the varsity division: Smith’s Fine Jewelry, Wal-Mart, Parkview Super Market, and Dexter’s Service Center. Only half a point behind is the Pharmacy at Union Square. Five of the eight team captains in the varsity still have perfect scores. In the JV section, Jessica Yost (6-year old member of Drs. Rhinehart team) is still in first place. Brent Kennedy (captain for Smith’s Watch & Clock Repair) is in second. Seth Nelling, member of the Lang Surveying Team, is a half point behind in third. The top JV team at the end of round 7 is Lang Surveying followed closely by Drs. Rhinehart in second, and Smith’s Watch & Clock Repair and Dragonfly Guitar Studio tied for third. Round 8 in league competition is scheduled for Wednesday, January 20. For additional information about the league, email execdir@amchess.org or visit www.bradfordchessclub.com. A Tidioute man has been sentenced to 9 months to two years in jail for fatally punching a man outside a bar last May. 25-year-old Brandyn Bynum had been charged with criminal homicide and aggravated assault, but accepted a plea deal to simple assault. Bynum punched 37-year-old Troy McFarland outside The Pub in Tidioute on May 9. McFarland fell back, hit his head on the curb and was pronounced dead at the scene. 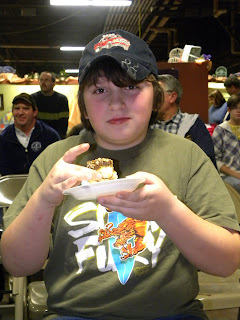 Harrisburg – Belinda Myers of Dallastown, York County baked her “B’s Sticky Buns” to win the first Sticky Bun Contest from among 62 other entries on Friday, Jan. 15 at the 2010 Pennsylvania Farm Show in Harrisburg. Myers, a part-time hairdresser and employee at Perry Dell Dairy, was absolutely shocked when they called her named as the winner. “It’s wonderful! I just can’t believe it!” Myers exclaimed after winning the contest. Myers not only earned bragging rights for baking the best sticky buns, but she also received $500 from event sponsor Good Foods Inc.
Second place and $100 went to Greta Slagill of Dillsburg, York County. Third place and $50 went to Alicia Knab of Hollidaysburg, Blair County. Eva Seibert of Allentown, Lehigh County received fourth place followed by Brenda Harper from Pennsylvania Furnace, Centre County in fifth place. 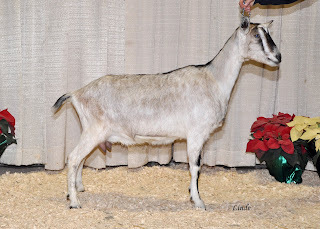 Harrisburg – Ann Weikel’s Toggenburg doe, GCH Rockspring T Gstone Gemstar, was named Dairy Goat Best Doe in Show on Friday, Jan. 15, at the 2010 Pennsylvania Farm Show in Harrisburg. This is Weikel’s third consecutive victory in the show. Seven breeds and divisions were represented totaling 297 head in the show, including Alpine, LaMancha, Nubian, Saanen, Toggenburg, All Other Purebreds and Recorded Grades. Grand Champion and Best of Breed: Milar-Farm Laurel Lonestar, exhibited by Catherine Soult of Newport, Perry Co.
Reserve Grand Champion: Country-Acres BD Sweetie, exhibited by Heather Moffitt of Mechanicsburg, Cumberland Co.
McNeil Consumer Healthcare is voluntarily recalling certain lots of over-the-counter products following an investigation of consumer reports of an unusual moldy, musty, or mildew-like odor that, in a small number of cases, was associated with temporary and non-serious gastrointestinal events. As a precautionary measure, 53 varieties of over-the-counter Tylenol, Motrin, Rolaids, and St. Joseph products have been taken off of Tops’ shelves as a result of McNeil Consumer Healthcare and the FDA applying broader criteria to identify and remove all product lots that it believes may have the potential to be affected, even if they have not been the subject of consumer complaints. 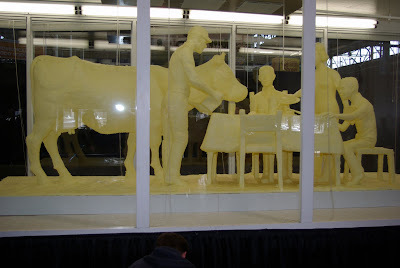 The 2010 butter sculpture is carved from 1,000 pounds of Land O'Lakes butter and depicts a dairy farm family enjoying breakfast together. Harrisburg – The 2010 Pennsylvania Farm Show in Harrisburg has a lot to offer maple syrup enthusiasts, with educational displays, competition and fresh maple syrup products available for sale. Janet Woods of the Pennsylvania Maple Syrup producers and the Pennsylvania Maple Syrup royalty presented a maple syrup production demonstration on Monday, Jan. 11, at the show. Together they covered a variety of topics including the types of trees used for syrup, the tools used in the production process and the history of maple syrup making. “Most people don’t know that it takes at least 40 gallons of tree sap to produce one gallon of maple syrup,” said Woods. Woods, an Erie County native, has been producing syrup her entire life and was the premiere exhibitor for the second year in a row at the 2010 Pennsylvania Farm Show. With 15 classes available, Woods was able to enter one of her products in every class. The special prosecutor assigned to conduct an investigation into the Cattaraugus County Sheriff's Department has released his findings. Wyoming County District Attorney Gerald Stout concluded that Sheriff Dennis John, who committed suicide last summer, was concerned about a sexual harassment lawsuit. The investigation centered on allegations of inapproprate use of text messaging and cell phone communication by members of the sheriff's department. Stout's office interviewed 16 people, and several cell phones were forensically examined by New York State Police. In a news release Stout said, "While it is probable the department cell phones were improperly used by members of the sheriff's department, there is no reasonable cause to believe that any crimes were committed." Two of the three Subway restaurants in Bradford are closed for business. The Main Street and Foster Brook Boulevard restaurants closed on Thursday. The owner says they can't comment on the matter publicly yet, but will contact us when they can. Meanwhile, the Subway inside the Foster Brook Walmart remains open. Paul G. Richey, 40, of 183 Doerr Road, Sandycreek Township, was killed in the line of duty late Wednesday morning, January 13, 2010. Paul was born August 29, 1969 in Franklin to his loving parents Clinton (Sam) and Nancy Garmong Richey. Paul was married August 6, 1994 to his devoted wife Carrie Cornell who survives. He was the proud father of two beautiful children Conner age 9 and Catherine age 6 who survive. He was actively involved with his children and helped with his son’s Cub Scout Troop and coached his little league team. He considered his wife and children his universe. A hearing on the proposed Holiday Inn Express on Forman Street is scheduled for next Friday in McKean County Court. In the hearing, attorney Greg Henry is expected to argue that the Bradford Zoning Hearing Board should not have granted variances to Tarport Properties for the proposed development. Henry represents Bradford Motel Associates, which objected to the Comfort Inn moving to the site where it's been for nearly 10 years. The variances the board granted in September included allowing the hotel to be four stories and 54 feet tall, when code allows for three stories and a maximum height of 50 feet; and allowing some of the parking spaces and landscaping to not follow code requirements. Developer John Stranburg said he isn't deterred by court action and plans to go ahead with the development. PennDOT has posted weight limit restrictions on another Cameron County bridge on Route 4004 (Ridge Valley Road). Effective today, the Fishing Creek Bridge in Shippen Township was posted for a 30-ton weight limit for single vehicles and a 40-ton weight limit for combination vehicles. Late in 2009, PennDOT also posted the Driftwood Branch Bridge on Route 4004 for 26 and 31 ton weight limits. The decision to post weight limits on the Fishing Creek Bridge was the result of a recent inspection. The Fishing Creek Bridge was built in 1944; is 33 feet long and carries an average of 1,037 vehicles per day. The posting for the bridge will remain in place until repairs can be made later this year. WASHINGTON, DC-U.S. Senator Bob Casey (D-PA) today outlined legislation he intends to introduce to implement a job creation tax credit. Senator Casey is working to add a job creation tax credit to a jobs bill that the Senate is expected to consider. Senator Casey’s proposal builds upon the jobs tax credit enacted in 1977 and was responsible for the creation of 700,000 jobs. Employers who increase their payroll by hiring new employees will be eligible to receive a tax credit. 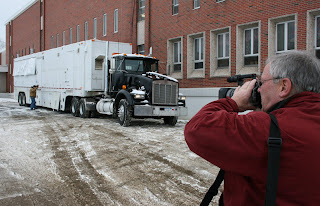 The television production truck donated to the university last year by Game Creek Video will be put to use just days after finally finding its permanent home. The 48-foot trailer was moved Wednesday morning from university property just west of campus to a cement pad at the southwest corner of the Reilly Center. Nine fire-safety windows had to be installed on that side of the Reilly Center before the trailer could be moved. By Saturday night, the trailer will be filled with students producing the men’s basketball game against Saint Joseph’s. Paul Wieland, instructor in the Jandoli School of Journalism and Mass Communication, said his Remote TV Production (JMC 401E) students will be producing nine basketball games this spring — five men’s and four women’s. Court documents filed Wednesday, and in 1997, say that 44-year-old Michael Smith had a history of drug use and violence. Smith's sister-in-law told police that he assaulted his wife, Nancy Smith, earlier in the day and threatened to kill her if the sister came to check on her. Police expect autopsy and ballistics tests to confirm Smith fatally shot his wife and Trooper Paul Richey when the trooper went to check on Nancy Smith after her sister called police Wednesday morning. State police found two other people dead Wednesday evening in an Oil City-area house that had been surrounded since Trooper Paul G. Richey was fatally shot just before noon. Police identified the people as 44-year-old Michael J. Smith, , and his wife, 53-year-old Nancy Smith. Both died of gunshot wounds. Police described the shootings as a double murder and a suicide. Police said they believe Michael Smith shot Richey and Nancy Smith before killing himself. Pitt-Bradford stunned 21st ranked Medaille Wednesday night 68-65 on 1490 WESB. The Mavericks were 13-0 and 8-0 in the AMCC coming into the conference matchup. Tyler Ferguson?s 16-footer with 2.5 seconds left and a foul shot were the winning margin for the Panthers. Zach Moore led the Panthers with 17 points. Dan Heisey added 15 points and Mike Ridge 10. Pitt Bradford improves to 6-3 in the AMCC. State troopers are blocking roads in the Oil City area near where State Trooper Paul Richey was fatally shot at just before noon today. Police are stopping motorists to ask if they've seen Michael Smith, who lives on the road where Richey was shot. Troopers are showing motorists a driver's license picture of Smith. Although they are looking for Smith, troopers have not named him as a suspect in the shooting. Police are advising all residents of the area to stay inside their homes. Harrisburg – Governor Edward G. Rendell offered his condolences to the family and friends of Pennsylvania State Police Trooper Paul G. Richey, 40, who died as the result of a gunshot wound suffered during an incident today in Venango County. Governor Rendell ordered that all flags at commonwealth facilities throughout state should be flown at half-staff in honor of Trooper Richey until his interment. HARRISBURG -- As part of continuing efforts to improve Pennsylvania’s infrastructure and safeguard communities, Governor Ed Rendell announced today that the commonwealth is investing nearly $1 million in 35 flood protection projects in 16 counties. The 35 flood protection grants announced today total $995,768 for project improvements, specialized equipment and non-routine maintenance. The winner of the first Downtown Bradford Snow Daze Tour gift basket is Joan Thompson of Bradford. The basket, filled with goodies from participating downtown Bradford merchants, was the winning prize of the Snowflake Scavenger Hunt. The audit, released this week by State Comptroller Tom DiNapoli, concluded that the State Department of Transportation (DOT) did not address 33.8 percent of serious highway bridge defects found by its inspectors within the required time frame, allowing hazardous conditions, including possible failures, to linger much longer than they should. Roswell Park Cancer Institute (RPCI) is the recipient of a grant from Susan G. Komen for the Cure for $186,000 to support research exploring the role of certain genetic markers in the development of breast cancer. Dr. Vita Golubovskaya, Associate Professor in the Department of Surgical Oncology at RPCI, is leading the exploration of two genetic indicators that have been linked to the growth of malignant tumors of the breast. These markers, known as the Focal Adhesion Kinase (FAK) and p53, have been noted separately in previous research as potential indicators for breast cancer. Dr. Golubovskaya’s research, however, seeks to establish a link between the two to prove that the presence of both could accelerate the growth of malignant breast cancer. Dr. Golubovskaya’s study theorizes that overexpressed FAK, when present with mutant p53, can block the effectiveness of traditional drug treatments, reducing their ability to destroy breast cancer cells. The Hospital & Healthsystem Association of Pennsylvania (HAP) recently named the organization’s 2010 board of directors and officers, effective January 1, 2010 including Edward C. Pitchford, president and chief executive officer, Charles Cole Memorial Hospital, Coudersport. HAP is a statewide membership services organization that advocates for nearly 250 Pennsylvania acute and specialty care, primary care, subacute care, long-term care, home health, and hospice providers, as well as the patients and communities they serve. Pitchford was elected to a three-year term on the board of directors after serving on the association’s Small and Rural Hospital Council and its Public Policy Committee. 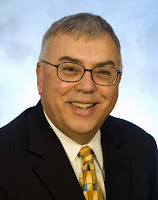 He is also a member of the board of directors of the Pennsylvania Rural Health Association. Washington, D.C.—U.S. Representative Glenn `GT’ Thompson, R-Howard, today supported an effort led by Rep. Vern Buchanan, R-Florida, to require public access to health care negotiations. Today Buchanan announced he is filing a discharge petition on the “Sunshine Resolution,” which would require public access to negotiations on the Democrats’ health care takeover. Thompson, a long-time sponsor of Buchanan’s bill, today signed on to the discharge petition. The procedure under House rules reads that Buchanan must have 218 signatures, a majority of the House to make the Democrats do what they promised and open the negotiations for Americans to see. Currently he has 151 bipartisan cosponsors of the resolution. Governor Ed Rendell said today that Department of Community and Economic Development Secretary George E. Cornelius will step down on June 30 to become the president of Bridgewater College in Virginia. Rendell commended Cornelius for his leadership and his work to position the commonwealth for a strong economic recovery as the recession ends. "Secretary Cornelius did an outstanding job leading DCED through some of the most challenging economic times we've faced," Rendell said. "He was committed to maintaining and enhancing the competitiveness of our industries, businesses and people -- frequently citing education as the most important economic development tool. "As an enthusiastic supporter of education, workforce development and skill building, I am sure he will excel in his new role as the president of Bridgewater College," the Governor added. Police have released more information about the state trooper shot and killed this morning near Oil City. 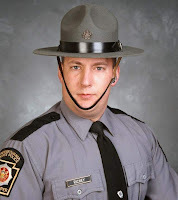 40-year-old Trooper Paul G. Richey was a 16-year veteran of the Pennsylvania State Police and was assigned to the Patrol Unit at Troop E in Franklin. Richey and Trooper Jason Whitman responded to a call at 11:34 this morning regarding a domestic incident on Bredinsburg Road in Cranberry Township. The troopers arrived at the scene at about 11:45 a.m. After getting out of their vehicles, Richey was hit with a shot fired from the house. Additional troopers responded and Richey was removed from the scene. A state police Special Emergency Response Team is on the scene and the incident remains open. "Trooper Richey sacrificecd his life rather than swerve from the path of duty," State Police Commissioner Frank Pawlowski said in a news release. "We will not forget his service or his sacrifice." A Pennsylvania state trooper is dead after being shot in a wooded area near Oil City this afternoon. Police closed down roads in the area and Cranberry High School, Cranberry Elementary School and Clarion University's Venango Campus were put on lockdown. Authorities haven't released the name of the trooper yet. Seneca Gaming Corporation is looking at another shakeup. The board has relieved Jeffrey Gill of his duties as chairman and elected former Seneca Nation treasurer Kevin Seneca. The board didn't give a reason for the vote at Monday's meeting. Gill had served only four months after Seneca President Barry Snyder Sr. forced Cochise Redeye out. He served as chairman for only six months. Redeye and Gill were both part of a faction of board members who ousted Snyder as gaming board chairman after he refused to cooperate with an audit looking at the Hickory Stick golf course purchase. Gill was in federal court Friday when disbarred attorney Timothy Toohey admitted that he had embezzled $202,000 in the Hickory Stick land deal. So far, Toohey is the only one charged in connection with the land deal. Federal officials say as much as $900,000 may have been taken from the Senecas. A Jamestown woman died in a house fire late Tuesday night. Police say the body of 52-year-old Deborah Harrier was found on a living room couch. An autopsy done this morning determined her death was fire-related. A family dog also died. Sometimes things aren't quite as simple as you think they're going to be. Like when a 5,000 gallon underground storage tank gets in your way. That's what happened to 6-V Excavation when they were working on the former Bradco site at 44-48 State Street, and discovered the old tank. On September 22, the city awarded a contract to 6-V to demolish, clear and restore the site. But discovery of the tank also included removal, disposal, additional grading work and fill. Tuesday, City Council authorized an additional payment of $2,260 to 6-V for the extra work. Also, the city approved a payment of $6,402 to Northeastern Environmental Management for proper disposal of the tank. The money comes from the OECD's Elm Street project account. Pennsylvania will begin selling tickets for the Mega Millions® multi-state jackpot game on Jan. 31, Lottery Executive Director Ed Trees announced today. Mega Millions jackpots start at $12 million, tickets cost $1 per play and drawings are held on Tuesdays and Fridays at 11 p.m. EST in Atlanta, Georgia. The first Mega Millions drawing for Pennsylvania players will take place on Tuesday, Feb. 2. Mega Millions tickets will be available for purchase at more than 8,400 Pennsylvania Lottery retailers, where players already purchase tickets for Powerball and other games. 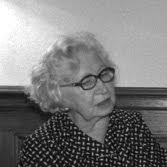 Tickets are available for purchase up to 13 weeks in advance and will be available for sale for the same night’s drawing until 9:59 p.m.
Miep Gies, one of the Dutch citizens who hid Anne Frank and her family from the Nazis, has died at age 100. Before the hiding place was emptied by the authorities, Miep retrieved Anne Frank's diaries and saved them in her desk drawer waiting for Anne's return. Once the war was over and it was confirmed that Anne had died in a concentration camp, Gies gave the collection of papers and notebooks to the sole survivor from the secret annex, Anne's father, Otto. For more on this story, go to CNN.com. Lockport resident Paul Kulniszewski says when he cut open an orange on Christmas morning he saw an image Jesus Christ on a crucifix with his mother Mary below. You can read the story and see the picture at the Lockport Union-Sun & Journal. House Speaker Keith R. McCall announced today that he has chosen to not run for another term as state representative for the 122nd Legislative District in Carbon County. "First off I want to say ‘thank you’ to the people of Carbon County for allowing me the honor and the privilege of serving you in Harrisburg," McCall said. "I’m proud to have lived my entire life here, and I hope and pray that my family and I will be here for as long as the Good Lord allows. "This decision is about my family. I first came to Harrisburg as a single 22-year-old man following in his father’s footsteps. Now I have a wonderful wife and two amazing children – all of whom I owe not only my thanks, but also a lot of missed dinners, football and baseball games, volleyball games and help with homework. Punxsutawney Phil is going high tech. The famous groundhog will send a text message of his prediction to people who sign up for the service. Mickey Rowley, the state's deputy tourism secretary, says he realizes that not everyone can go to Punxsutawney for Groundhog Day, so this is a good way to get the word out. People who want a text message from Phil can text "Groundhog" to 247365 until Feb. 2. A Benezette man suffered minor injuries in an accident Monday evening on Gray Hill Road in Benezette. Police say an SUV driven by 66-year-old Robert Howard was going around a curve when it crossed into the opposite lane, left the road, hit an embankment, crossed and left the road again, traveled over another embankment and hit a tree. Police say Howard was cited for driving at an unsafe speed. Four people were hurt in a three-vehicle accident Monday afternoon on Route 49 in Allegany Township, just east of Cahilly Road. Police say a car driveny by 18-year-old Kristen Gray of Ulysses went out of control on the snow-covered road, crossed the centerline and slid into a van driven by 70-year-old Darrell Hults of Turtepoint, which was forced off the road. The car spun around and hit another van driven by 60-year-old John Campbell of Harrison Valley. Gray and Hults, along with 70-year-old Shirley Redmond of Port Allegany who was a passenger in the Hults vehicle, suffered minor injuries. A 17-year-old passenger in the Hults vehcile suffered moderate injuries and was treated at Charles Cole Memorial Hospital. Police cited Gray for driving at an unsafe speed. 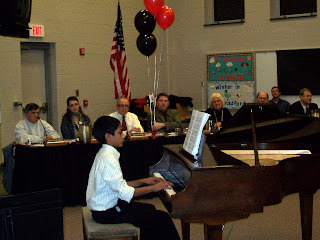 7th grader Manu Gajanan plays the piano as Bradford Area School members and superintendent Sandra Romanowski listen during Monday's school board meeting. In recognition of School Directors Appreciation Month, students from all four Bradford schools presented programs. 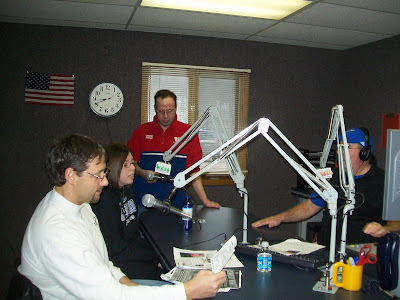 You can hear them all on today's LiveLine at 12:30 p.m. on 1490 WESB and online at WESB.com. No one was hurt when an SUV hit a school bus Monday afternoon on Grant Road in Ridgway Township. State police say the bus driven by Donna Feronti of Ridgway was legally stopped when it was hit from behind by the SUV, driven by Kimberly Hoyt of Ridgway. 5 boys and a girl were on the bus at the time of the accident. Police say Hoyt will be charged with driving at an usafe speed. The Bradford Area School District has decided it wants to get in on the Race to the Top. Race to the Top is part of the federal economic stimulus package, and offers grants to states for school reform, but only 7 to 10 states will be selected. If Pennsylvania is selected, it will get $400 million. The Bradford school district would get between half a million and a million and a half dollars, according to School District Superindentent Sandra Romanowski. She says Bradford schools are already following many of the program's guidelines. "This is everything we're supposed to do anyhow," she said during Monday's school board meeting, "so why would we not apply for money to do the things we're going to have to do anyhow?" Romanowski and School Board President Tim Bean have already signed off on the memorandum of understanding. The teacher's union is expected to address the matter during a meeting Tuesday. A teenager who admitted to his role in a riot at the Randolph Children's Home in May has been sentenced to a year in prison. 17-year-old Raymond Neville pleaded guilty in October to rioting and criminal mischief. Neville has already served most of the year sentence and could be released within two weeks. PennDOT has posted weight limit restrictions on two bridges in Potter County. Effective today, the Genesee River bridge on Route 1011 (Ulysses/Hickox Road) in Bingham Township was posted for a 30-ton weight limit for single vehicles and a 37-ton weight limit for combination vehicles. Also effective today, the Phoenix Creek Bridge on Route 1005 (Phoenix Run Road) in Pike Township was posted for a 36-ton weight limit for single vehicles and a 40-ton weight limit for combination vehicles. The decision to post weight limits on the bridges was the result of recent inspections. The Genesee River Bridge was built in 1941; is 45 feet long and carries an average of 600 vehicles per day. The Phoenix Creek Bridge was built in 194; is 55 feet long and carries an average of 220 vehicles per day. The postings for the bridges will remain in place until repairs can be made. Rep. Martin Causer (R-Turtlepoint) is encouraging people concerned about proposed changes to state regulations for outdoor wood-fired boilers to speak out at a public hearing in Coudersport this week, Rep. Martin Causer (R-Turtlepoint) announced today. The state Department of Environmental Protection and its Environmental Quality Board (EQB) will hold the hearing at 6 p.m. Wednesday, Jan. 13, at the Coudersport Area High School. "I asked DEP to hold this hearing locally because so many people came to me to express their opinions about the proposal," Causer said. "I encourage everyone to take advantage of this opportunity." · A person may not purchase, sell, offer for sale, distribute or install a boiler unless it meets Phase 2 standards for efficiency. · New boilers must be installed at least a minimum of 150 feet from the nearest property line. A Bradford man is facing charges following a traffic stop in Chautauqua County. State police say 24-year-old Cotton Winston was stopped on Interstate 86 in the Town of North Harmony. Winston was charged with criminal possession of stolen property and cited for driving without a license, speeding and unlawful possession of marijuana. Winston is scheduled for a preliminary hearing Wednesday in Bradford on charges of hindering apprehension and conspiracy to commit retail theft. A Ridgway woman was hurt in an accident at 9:25 this morning at the intersection of State and Sugar Hill roads in St. Marys. Police say 79-year-old Shirley Wolff was going down Sugar Hill Road when the vehicle began to accelerate. When it reached a slight grade at the intersection, the vehicle became airborne and traveled for 500 feet over State Road, then into a field. Wolff was taken to Elk Regional Health Center for treatment of her injuries. National Fuel Gas employees assisted police at the scene. An Emporium woman was hurt in an accident at 3:30 this afternoon on Route 120 near Turkey Foot Road in Cameron County. State police say an SUV driven by 20-year-old Elizabeth Nellis went out of control onthe snow-covered road, traveled across the road and turned onto its roof in a ditch. Nellis was taken to Elk Regional Health Center for treatment of moderate injuries. Police say she'll be charged with a summary traffic violation. A fire that damaged an Austin home has been ruled accidental. The fire was reported at about 10:30 Saturday morning at the home of George Sams at 119 Ripple Road. A state police fire marshal and Austin Fire Department determined that the fire started in the ceiling area around the chimney pipe. The fire was contained to the attic and roof of the building. The rest of the house had major heat damage. Damage is estimated at $18,000.